In Orwell’s 1984, the protagonist Winston Smith works in the Records Department of the Ministry of Truth as an editor, revising historical records, to make the past conform to the ever-changing party line and deleting references to unpersons – people who have been "vaporised," i.e. not only killed by the state but denied existence even in history or memory . What we present here is data storage that is not rewritable. It is a distributed decentralized database where records can neither be revised nor deleted entirely. Bitcoin  was the first system to introduce tamper proof records designed for the specific purpose of tracking the ownership of electronic currency units known as bitcoins. In Bitcoin, all transfers of the currency are represented as transactions that are digitally signed by the current owner of the coin, transactions are bundled into blocks, and blocks are linked into a chain (blockchain) secured by proof of work (PoW) that assures that large computing resources have been invested into building the chain. Any attempt to rewrite anything contained in the chain would therefore require even larger computing resources than those that have already been expended. Soon after Bitcoin appeared, it became clear that this was more than just a trust-free P2P electronic currency. Its technology became a source of new ideas for solving other problems. At the same time, Bitcoin’s deficiencies and limitations equally became clear. 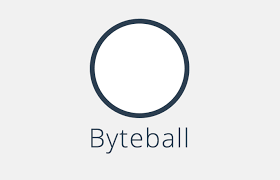 Byteball is designed to generalize Bitcoin to become a tamper proof storage of any data, not solely transfers of a single electronic currency, and remove some of the most pressing deficiencies that impede a wider adoption and growth of Bitcoin. In Bitcoin, transactions are bundled into blocks, and blocks are linked into a single chain. Since the blocks are linked linearly, their spacing in time and their size are optimized for near-synchrony among nodes, so that the nodes can share a new block with each other much faster than it typically takes to generate a new block. This ensures that nodes most likely see the same block as the last block, and orphaning is minimized. As Bitcoin grows, blocks become increasingly unwieldy. They are either capped in size, in which case the growth is also capped, or they take too long to propagate to all nodes of the network, in which case there is greater uncertainty about which block is last, and more resources are wasted on extending chains that would later be orphaned. In Byteball, there are no blocks, transactions are their own blocks, and they need not connect into a single chain. Instead a transaction may be linked to multiple previous transactions, and the whole set of transactions is not a chain but a DAG (directed acyclic graph). Bitcoin transactions are secure because it is prohibitively expensive to redo all the PoW included in the blocks created after the transaction. But that also means that it is necessary to pay to build the legitimate PoW that is strong enough to ward off any attackers. This payment is spent for the electricity required to build the PoW. What is important to note here, is that this money goes outside the Bitcoin ecosystem – to energy companies – meaning that the community of Bitcoin holders as a whole is bleeding capital. In Byteball, there is no PoW, instead we use　another consensus algorithm based on an old idea that was known long before Bitcoin. Transaction finality in Bitcoin is probabilistic. There are no strict and simple criteria for when you can say that a transaction will never be reversed. Rather, you can only argue that the probability of a transaction being reversed exponentially decays as more blocks are added. While this concept is perfectly clear to those versed in math, it might be a difficult sell to an average Joe who is used to expecting a black-or-white picture in matters of money ownership. To complicate things even further, transaction finality also depends on its amount. If the amount is small, you can be reasonably sure nobody will try to double-spend against you. However, if the amount at stake is greater than the block reward (12.5 BTC at the time of writing), you might speculate that the payer could temporarily rent hashpower to mine another chain of blocks that doesn’t contain the transaction that pays to you. Therefore, you have to wait for more confirmations before being sure enough that a high-value transaction is final. Byteball, there are deterministic criteria for when a transaction is deemed final, no matter how large it was. The Bitcoin price is known to be quite volatile. The bigger problem is that this price is not only volatile, it is not bound to anything. Share and commodity prices are also very volatile but there are fundamentals behind them. Share price is largely a function of company earnings, revenue, debt-to-capital ratio, etc. Commodity prices depend, among other factors, on costs of production with various suppliers. For example, if the oil price falls below the production costs of some suppliers for a long time, these suppliers will eventually shut down, decreasing production and causing the price to go up. There is a negative feedback loop. In Bitcoin, there are no fundamentals, and no negative feedback. A Bitcoin price of $500 is no more justified than a price of $50,000 or $5. If the Bitcoin price moves from where it is now, this movement alone will not create any economic forces that would push the price back. In Byteball, the base currency, bytes, is used to pay for adding data into the Byteball database. You pay 1,000 bytes to add 1Kb of data. It is a measure of the utility of the storage in this database, and actual users will have their opinion on what is a reasonable price for this. If the price of byte rises above what you think is reasonable for your needs, you will find ways to store less bytes, therefore you need to buy less bytes, demand decreases, and the price falls. This is negative feedback, common for all goods/services whose demand is driven by need, not speculation. Besides paying in bytes, one can issue other assets and use them as means of payment. These assets might represent, for example, debt expressed in fiat currencies or in natural units (such as kWh or barrels of oil). The price of such assets is naturally bound to the underlying currencies or commodities. All Bitcoin transactions and balances of all addresses are visible on the blockchain. Although there are ways to obfuscate one’s transactions and balances, it is not what people have come to expect from a currency. Transactions in bytes (the base currency) in Byteball are equally visible, but there is a second currency (blackbytes), which is significantly less traceable. Bitcoin was designed as an anonymous currency where people have absolute control over their money. Bitcoin incompatible with existing regulations, and hence inappropriate for use in the financial industry.